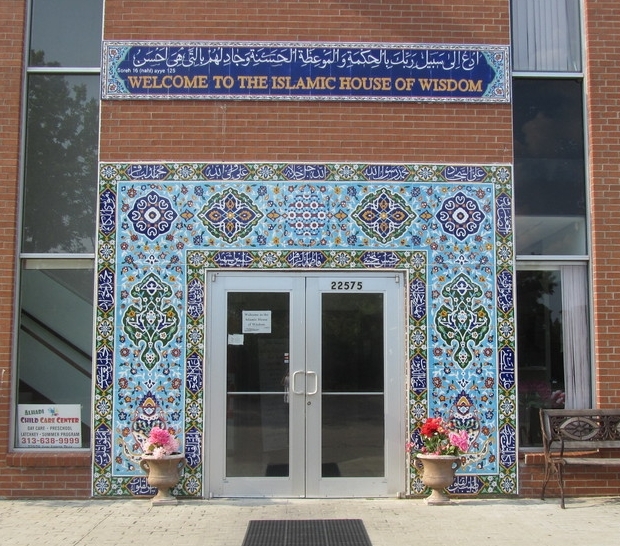 Main Entrance of the Islamic House of Wisdom. Q: How can I schedule a meeting with the Imam? Q: What is the best time to visit the Islamic House of Wisdom? A. The best time to visit is on Friday's at the time of Friday Prayer because this will give you an opportunity to observe/participate in the congregational prayer and get in touch with Muslims from the community. Q: Is there a dress code for visiting? A. Islamic Dress attire is required for entering the prayer hall. Men should wear long pants and half/full sleeve shirts. Women should wear long pants or long skirts and long sleeved tops / shirts. If the ladies do not have a scarf with them, we have scarves available near the office for use while in the mosque. Q: Where do I get a head scarf? A: The Islamic House of Wisdom has scarves available at the entrance for those who do not have a scarf with them. There are also various stores within the Dearborn- Dearborn Heights area that offer Islamic Style headscarves. Wearing a scarf has become a popular trend, you will find scarves available in some of the larger fashion retailers as well! The IHW office secretaries are ready to help! Q: Do I have to take my shoes off? A. Shoes are allowed in the building except for the prayer room. Only in the prayer room, we ask that shoes are removed before entering. Q: I'm not a Muslim, can I still visit? A. Islamic House of Wisdom is open to all who would like to visit. Whether to meet with Imam Elahi to address any questions pertaining to the Islamic faith, a tour, or if you would like to visit during one of our services! Q: Can my class, congregation or youth group visit the mosque? A. We receive requests almost weekly, sometimes daily! Feel free to schedule an appointment to visit the mosque for a friendly discussion, tour or occasion to break bread together!